Throughout January the heat continued unabated. Although we got off lightly compared to others in Australia, several days in a row of 40 degrees, and many in excess of 36 made gardening not an option. In Mudgee, our maximum temperature for the whole month was 4.9 degrees above average, making it the hottest January ever. That makes the Paris Agreement to keep global warming to less than two degrees look shaky to say the least, in my opinion. Something climate change deniers should contemplate. We have been lucky to have some rain. Last Tuesday a wildly clamorous and exhilarating storm with thunder and lightning that made us feel as though we were under siege, brought us 33mm for which we were exceedingly grateful. After a few week’s absence, I am joining in with Six on Saturday, hosted by the Propagator. If you would like to either join in or see what other gardeners are experiencing, , follow this link. My first photo (above) is of Tulbaghia or Society Garlic, a redoubtable garden member, reliable always no matter how hot the weather. 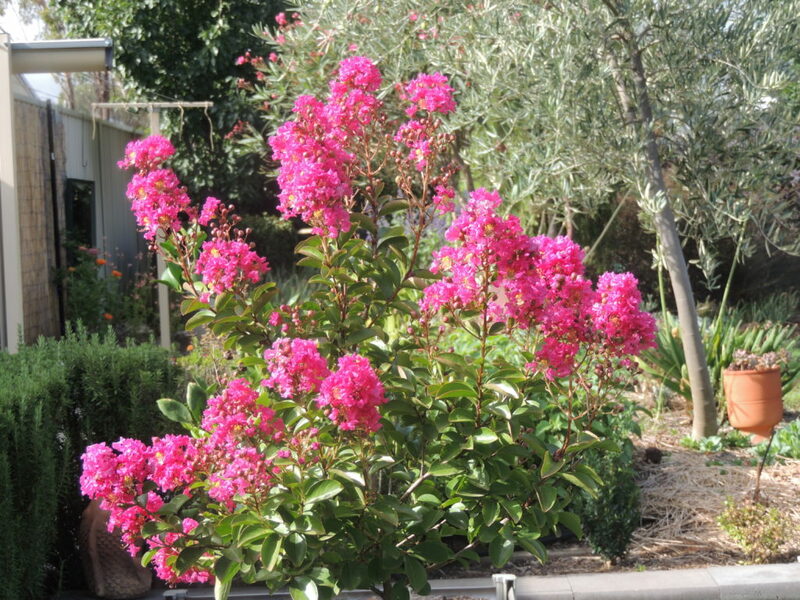 Two: A new Lagerstroemia ‘Tonto’, still only small, is enjoying the heat and growing well. Some people aren’t keen on crepe myrtles, but they grow so well in our climate and are colourful for so long, I think they’re a very worthwhile addition to the garden. Three: White Vinca makes a sweet frill around the base of these compact Raphiolepis. Four: Ceratostigma also known as Chinese Plumbago has a small flower, but the strength of its blue colouring makes up for its lack of size. I’m looking forward to this plant spreading itself around as it makes a pretty groundcover with leaves colouring beautifully during autumn. Five: Once again, Sedum ‘Autumn Joy’ is preparing to flower, even though there’s easily a month of summer left. Six: Finally, a new pair of gardening shoes, my favourites already, a Christmas present from Mr MG.
That’s my six for this week. All the hedges need cutting, there’s weeding to be done and there have been deaths in the garden which need to be dealt with, but it’s still way too hot, so a siesta is the go, I think for the rest of the afternoon, and several cool drinks tinkling with ice. Previous Post Troopers: 1st January, 2019. It’s eased up for the moment, thanks, Derrick, but I think more is on the way. I’m interested to see that you grow some of the same plants which do well in my corner of SW France. Lagerstroemias are very popular here, and I have 5 trees either side of the drive and one free standing bushy one in the lawn. They look spectacular in the summer. I also grow Ceratostigma plumaginoides, one of the few true blue flowers which I managed to get for a blue and purple border in the front garden. 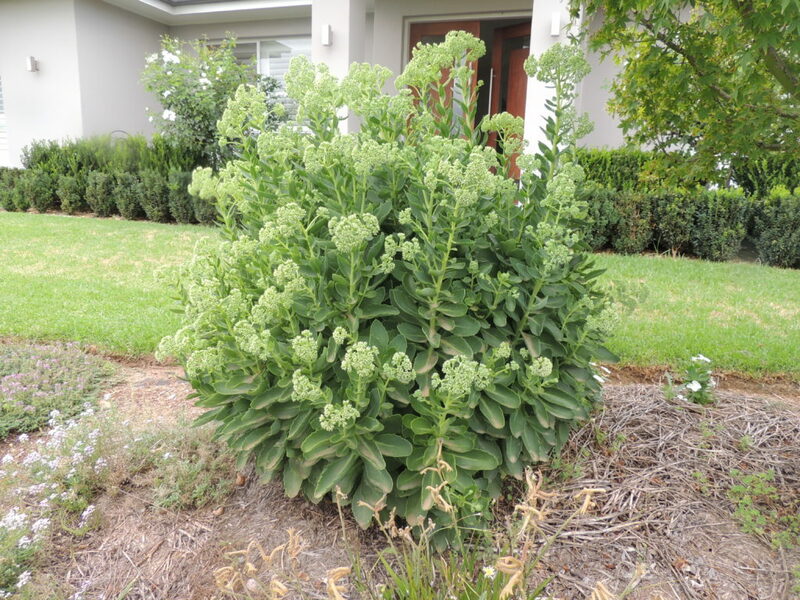 I have a Lagerstroemia in my lawn too, Christine. It’s a white one called ‘Natchez’ which although it doesn’t flower for along as some of the others, is a really nice shape, and I’m looking forward to it providing some dappled shade eventually, when it gets big enough. I don’t prune Lagerstroemias hard like some people do. We have had similar weather in Canberra, punishing on the garden in every way. However, the crepe myrtles all around Canberra look lovely, including our new one. I don’t have Tulbaghia (Society Garlic) but I must look out for this plant, doing so well in a similar climate. We always plant plenty of real garlic, but this year we have had a very poor crop. Tulbaghia is a great plant to have in our climate Gerrie as it seems to be so hardy and flowers well into Autumn. It’s funny, my garlic crop was rather disappointing this year too, but I heard someone on Radio National saying that garlic needs to acclimatise to your soil, and you should save cloves from the present crop to replant. It seems we can expect better success next time! I hope you get some more rain Pauline, but not a deluge such as the one occurring in Townsville at the moment! It seems incredible to think of you in all that heat as I look out over snow-capped mountains this morning, Jane! I love the tulbaghia, like a tiny agapanthus and so pretty. The ceratostigma is a gorgeous blue, great value with autumn colour, too. Love, love, love those gardening shoes! Hope this week brings kinder temperatures and another drop of rain – you are completely right where climate change is concerned. Thanks, Lis. I’m thinking how lovely it would be to be looking at snowy peaks and be far enough away to not be too cold. Sounds perfect! We’re probably flying to Australia later this year to see 3yr old granddaughter, contributing to damaging her future in the process. Bizarrely, the environmental militancy around when I was a teenager seems to have evaporated. Even the non climate change deniers are very reluctant to change their behaviour. That was all a bit political for a gardening blog but you can’t be a gardener and not see the problem. I thought of being even more political, Jim, but I held back! Good to hear you received some rain, Jane. We’ve had thunderstorms and a few heavy drops of rain, but as usual the wind is a problem. 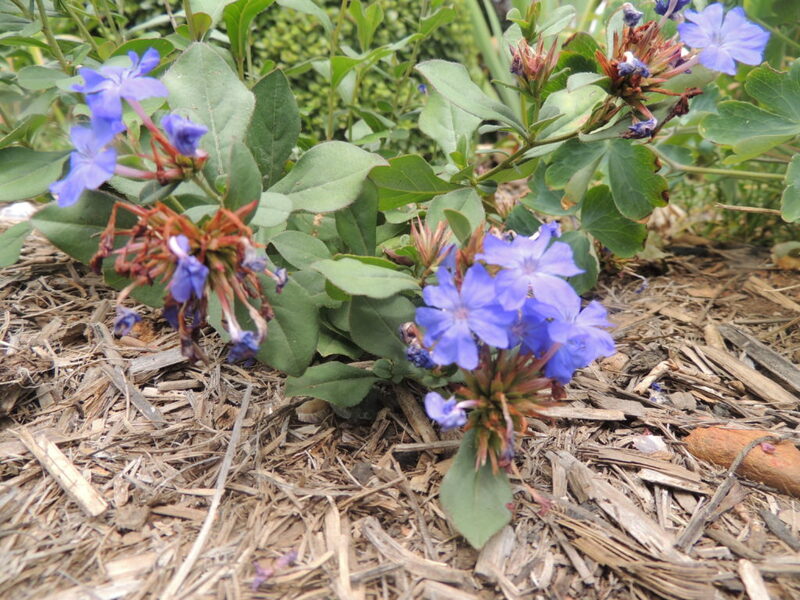 Your Chinese Plumbago is looking gorgeous – hope it increases in size. Love the Crepe Myrtle. I’ve only seen it in shade in the Royal Botanic Gardens and didn’t realise it did so well in the heat. Ugh, wind as well as heat. Horrible combination Vicki. The crepe myrtles are beautiful around here and I wish our council would plant more of them, they’d be as eyecatching as jacarandas. Love your Sloggers. I have some with chickens on them. They are perfect for wading though mud in the garden. If only we could give you some of our extreme bitter cold to even out your extreme hot, then we all would be comfortable and happy. We gardeners are never quite satisfied, Cindy. It would be great if we could do some of that evening out! I’m afraid my Sloggers are completely untested in the mud department! Your garden looks lovely and green and quite colourful! Love the Crepe Myrtle as well. I would think anything that can withstand your heat and provide such vibrancy would be welcome eh? Funny, or perhaps logical, that while we had a few record breaking cold days, you had a record breaking hot month in January. Sedum Autumn Joy seems to have conquered the world! How tall is yours – the photo makes it look huge! My Sedum is about 80cm tall, Chris. I don’t know if that’s big for a Sedum or not, but I’m always amazed at how quickly and healthily it grows back from ground level at this time each year. I use an old pair of running shoes for gardening but I am tempted to buy a pair like yours!! Lovely. Nice to see sunshine and colours at this time of the year. Thanks, Granny. Sunshine and colours we have in plenty! Like you, Jane, I’m pleased to see the back of January. I’m ticking off February too. I’m a fan of the crepe myrtles and yours is looking very healthy. I fear February will be a bit trying too, Tracy. I have half a dozen crepe myrtles in the garden and they all seem to be performing well in this weather. Hi Fred, the Lagerstroemias I have all come from the ‘Indian Summer’ range, bred to be powdery mildew resistant, although as you say, it’s less likely to be a problem here than it would be on the coast where the summer is much more humid. I am glad your garden is surviving the heat. Australia has really been suffering and anyone who doubts global warming is unhinged. The picture of your myrtle reminded me of something i want to try too. Yes, do try them, Cathy, I’m sure they’d do well for you, especially those from the ‘Indian Summer’ range which have been bred to be resistant to powdery mildew. Funky set of shoes. My wife is always encouraging me to get some but I like my walking shoes. 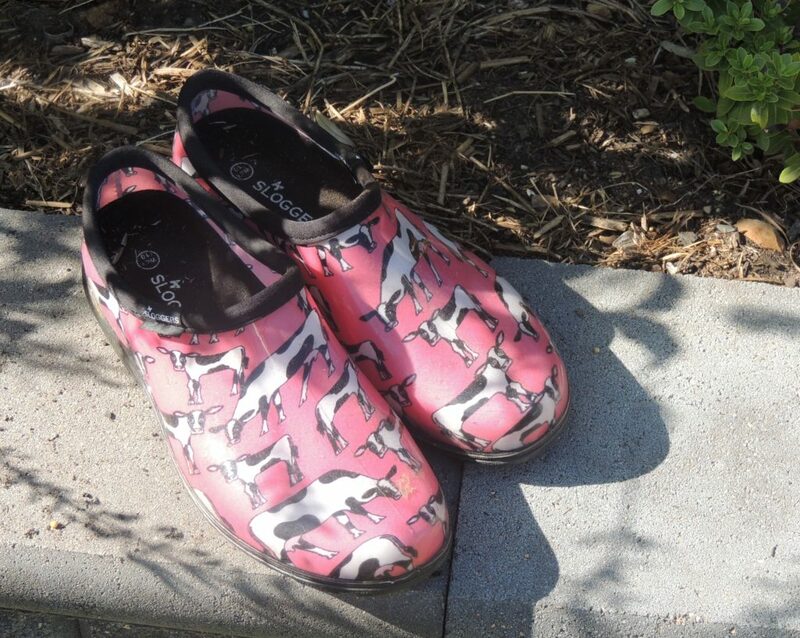 Well, They might look better on you than pink cows! You’re doing a grand job with your garden despite the heat. It’s looking green and colourful. Never heard of Society Garlic before – looks impressive. Thank you, I have to admit that I’ve put a fair amount of water on it, and the rain last week cheered everything up as well. Your garden is looking lush in spite of the heat, thank goodness for some rain! I have been out with the camera in the snow today.. quite a contrast after the heat of Australia and I’m feeling it. I notice the thumb grip has fallen off the camera and part of the rubber covering has expanded and is now loose. Guess I can blame the heat for that too. I expect it would be a shock to experience cold after your eight weeks of pretty torrid weather! With heat like that I’d be glad to see the month close too. I’m impressed by how wonderful your crape myrtle looks. I’m very tempted to try one here but remain concerned that our marine layer will leave it covered in mildewed leaves. I love that brand of garden shoes too. I got myself a new pair in December after wearing out my first pair. We have Lagerstroemias here that are bred to withstand mildew so perhaps you could look to see if those are available in the US. I’m sure they’d be rewarding to grow, and the variety of shades is very tempting. Thank you, Jude. Someone else commented on the size of the Sedum, and I was a bit surprised as I thought that’s how they always are. I think it’s about 80 cm tall…perhaps the photo is a bit deceptive. I’m sorry to hear about the rain in the conservatory-it seems as though you’ve had more than your fair share of trouble with it. I didn’t know plumbago came in a groundcover variety. The colour is always so uplifting. I must look out for this version. We didn’t get the extreme heat that the southern states have endured, but it has been constantly over 30 degrees most days this summer. Good to hear you got some rain. This is a different plant from the plumbago usually seen in gardens which isn’t really happy here as it doesn’t like the frost. The common name, ‘Chinese Plumbago’ is a bit misleading. I don’t think I’ve seen this in local nurseries, and I sourced minefrom Lambley Nursery online. Jane, I am glad January is gone too! it’s my least favourite month, we had many days with temperatures over 40C and lots of rain.. not a nice combination at all, “el niño” is causing heavy rainfall in what usually is our driest month, weeds are totally out of control and the garden fell into almost total neglect as happens every summer, I will try to gather energy and will to prune my roses next week, they will resurrect with the cooler days of fall. Ugh, I think your weather is far worse than ours, Marcelo. 40 degrees and humid as well- horrible! My garden is neglected too, it’s just too hot to go out and do anything just now and there’s still another month of heat to go. The Society Garlic looks wonderful. I think we may get some rain this week on this side of the Tasman. I hope you do, Barbara! We have lots of sedum starting to flower. They are very slow growing and the heat would not have helped. the crepe myrtle is flowering everywhere. I like their smooth sculptural trunks and branches, feeling this smoothness always tempts me. Yes, the trunks are very decorative, Gerard. Mine are too small to have achieved that yet. Thanks, Amy. 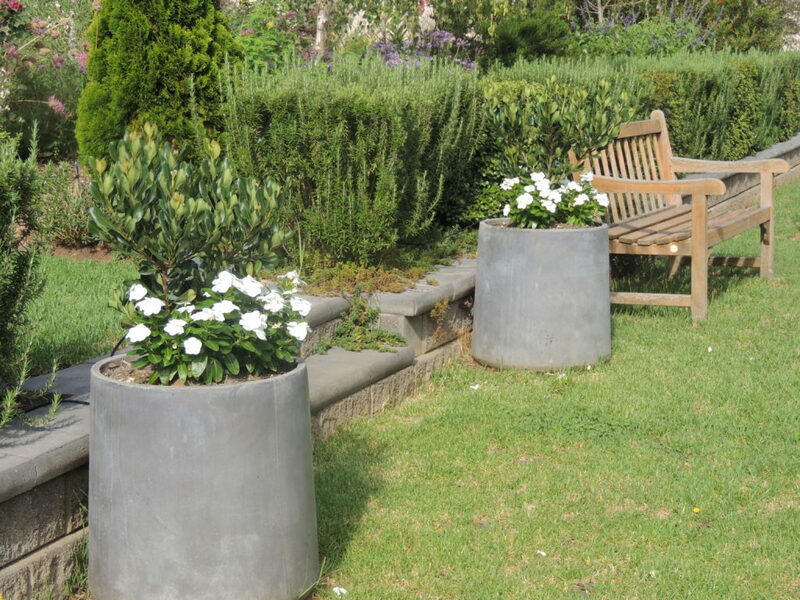 I’m rather pleased with the white vincas. What is it going to take for the critical mass to take global warming seriously? It is so frustrating! However, your post is a joy, Jane. I am getting desperate for some colour in the garden and to see your crepe myrtle, which I love, was a tonic for my soul. We have a government that is distressingly slow to do much, Ali: I’m hoping for a serious change at the next election. Thanks for your nice comment re crepe myrtles. Blimey, look at that autumn joy! It might be a trick of the eye but it looks huge in that picture! How tall is it? I found our unusually hot summer last year very difficult to deal with, constant watering required. I am busy planning an extensive irrigation system. If installed, this will almost guarantee torrential rain all summer…. A number of people have asked about the size of Autumn Joy who seems quite normal to me- I think about 80cm tall. I didn’t take the photo from ground level either, which would have accentuated the size. I have an irrigation system in my garden and although it saves a lot of time with a hose or watering can, it has also caused me to overwater some things. Nothing’s perfect! The photos don’t tell the whole story, Gill. There are plenty of plants really suffering: things I probably should never have planted, things I’ve overwatered. It’s such a process of trial and error. six lovely photos, ending with those lovely shooooos! And I’ve finally looked up where Mudgee is, and realise it’s a long way away from where I live, in the lower mid north of South Australia, in the Adelaide Plains council region, but weather is weather, and we all get rain, sometimes, anyway, and today we got a brief burst of rain and I turned it into a poem, using the #poemadayfeb prompt of “Quatern” which is an interesting poetry form, which I don’t think I’d ever used before. Hopefully the weather has cooled down a bit and you’ve had some rain, Carolyn. Last year we took a holiday down your way and very much enjoyed the scenery around Adelaide and down to the Eyre Peninsular. It was very green at the time, a stark contrast to NSW. Your sedum looks great, Jane! Thank you Jane. It’s just beginning to turn pink now.